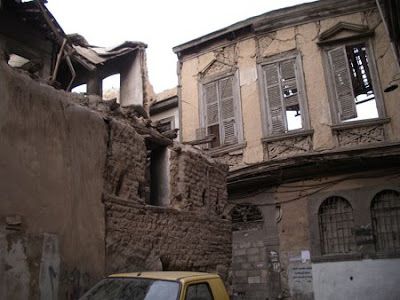 In Amara, the destruction was avoided, in Medhat Pasha renovation is underway - but in Saroujah, the argument goes on. Official documents show a decision is going to be made by the end of the year - a generation after the controversy began. Saroujah holds a special place in my heart. 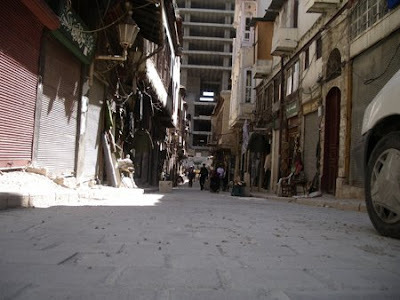 I named my blog after the area - it is MY Damascus. And I get incredibly defensive when it is threatened. But Saroujah is defined by the threat of destruction. For thirty years, plans to destroy Saroujah - not renovate it - have hung over this area. Saroujah is an odd case. It is just outside the city walls (you can see the Umayid Mosque in the background - below), but because it is hundreds of years old, it comes under the remit of the Old City renovation authorities. Souq Saroujah - the Saddlemakers' Market - is concentrated around one thin road of the same name. 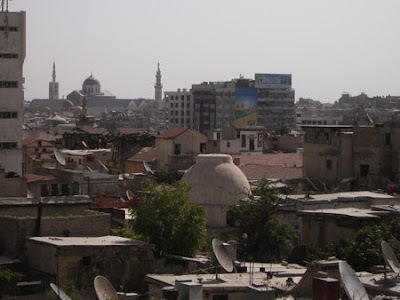 The Mosque (below) and Hamam (the dome in the picture above) are at the centre of the community. But not many people live in Saroujah any more. 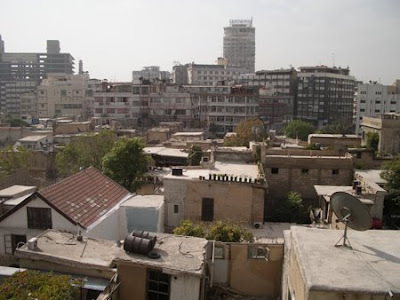 Thirty years ago, the Damascus authorities started evicting residents, to build ugly modern tower blocks for the booming population. Work to get rid of the old houses, and put up tower blocks, started in the south-west corner of Saroujah. But this modern corner of Saroujah isn't all bad - the pure-white French Cultural Centre (the CCF) is a work of art. It was designed by French architect José Oubrerie in the 1980s, and looks as fresh today as it did two decades ago. The remaining residents knew their houses would be next. But as suddenly as the work started, it stopped again. Many old Saroujans are some of the city's richest people. And with wealth comes power. They weren't going to let their area fall victim to modernisation. A temporary halt was placed on the demolition. But with the threat of eviction hanging over them, no-one was going to waste money repairing a house which could be seized. So they let their houses fall into disrepair. And gradually they moved out - ironically, many went to the modern European-style flats in the neighbouring Ayn Kirsh, just to the north of Saroujah. But recently, the organisation which looks after the Old City - and works well with the European Union to do it - has taken over responsibility for Saroujah. So is a change in Saroujah's fortunes in store? They are already looking into the legality of the 'evictions', which are still officially 'on hold'. Hopefully they will say that there is no legal basis to the idea. 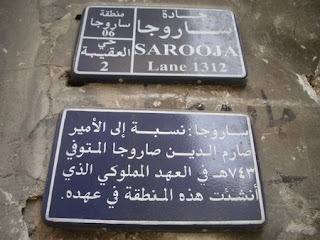 It is the Old City authorities - not the Muhafaza (Damascus City Council) - which is responsible for Saroujah now. They have a very different set of priorities - renovation and protection - not destruction and modernisation. So hopefully, the news at the end of the year will be good. For Saroujah's sake. Beautiful post Sasa, and I love the new banner at the top. 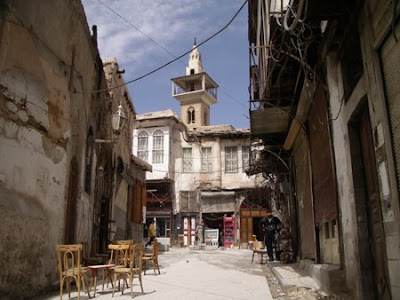 Will you be in Damascus this summer? Thanks for your kind words Yaman. I'm bouncing between London and Damascus this year - I think I'll be in London in the summer and Damascus in the autumn. How long will you be in sham? Thank you Yazan. But there's one more to come! Oh.. I had the impression that this was the finale. Sorry.. Looking forward to reading the next one though. It was the last main piece - then I discovered something else! But I only found out about it after I'd written this! And there'll be more later in the year. I was going through my list of things to write about yesterday an I realised, this could be a 15 part series!! I really truly hope it's good news... we need a bit of them. Good post as usual, Sasa. I hope you are being read by the people who make decisions, and I hope they realise the obvious: preserving Damascene heritage keeps people happy and proud of their city, as well as making more money for everyone. Rich tourists want to come to Damascus to see what makes it unique. You can't find beautiful old alleys, mosques and hammams in Europe. But you can find ugly tower blocks everywhere. Thanks Qunfuz. I hope so too. And I wholeheartedly agree. I think one good thing is that people care so much about the Old City. And also that there are a lot of outside eyes on the Old City. Unesco cares - because of the World Heritage Status. And the EU is actively involved in 13 projects in Damascus. And despite all my criticisms, I think Maktab Anbar is doing a good job of keeping the Old City's development very very separate from that of the new city.